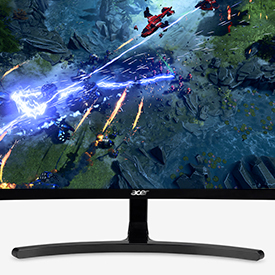 Acer's 23.6-inch curved panel monitor with Full HD 1080p resolution delivers the incredible. Crisp, true-to-life colors come alive with the amazing 1920 x 1080 resolution, allowing you to enjoy High-Definition entertainment in the comfort of your home. The wide view angle technology lets you share what’s on your screen with friends and family as colors stay true no matter what angle you’re viewing from. AMD FreeSync technology and a rapid response time ensure your games, work and movies are smooth and look as epic as possible. The Acer 23.6" Curved Display with Full HD (1920 x 1080) resolution offers exceptional picture quality with a broader view. This monitor presents stunning, lifelike images with an amazing level of detail that makes games more exciting and movies truly cinematic. 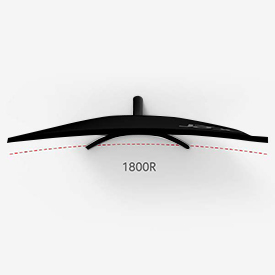 The curved 16:9 display wraps you in a world of entertainment with every corner of the screen at the same distance from your eyes for a uniform viewing experience without blind spots. 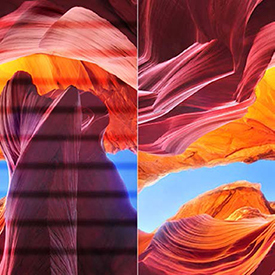 Tilt the screen -5 to 15 degrees for the most comfortable view. 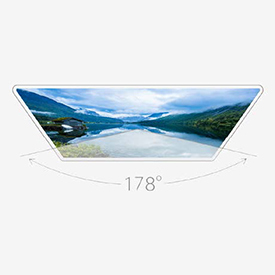 The Acer curved monitor was designed with wide viewing angle feature which displays color accurately up to 178 degree so that no matter which angle you choose to view it from, your monitor will display colors perfectly. 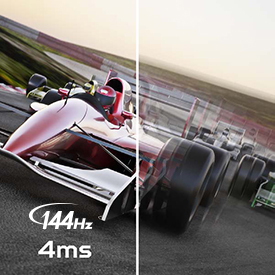 Keep pace with the action as the rapid 4ms response time and 144Hz refresh rate reduces ghosting and smearing so you can watch in vibrant clarity without any blur. Enjoy seamless viewing with AMD FreeSync technology, which eliminates screen tears so that you can game without the possibility of jitter. 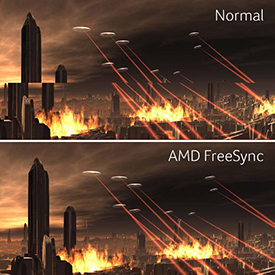 With AMD FREESYNC, the game’s frame rate is determined by your graphics card, not the fixed refresh rate of the monitor. These monitors reduce eye-strain while catering to your viewing needs. Acer Flicker-less technology and BlueLightShield deliver a viewing experience without jitter and lessen the impact of irritating blue light on your eyes.